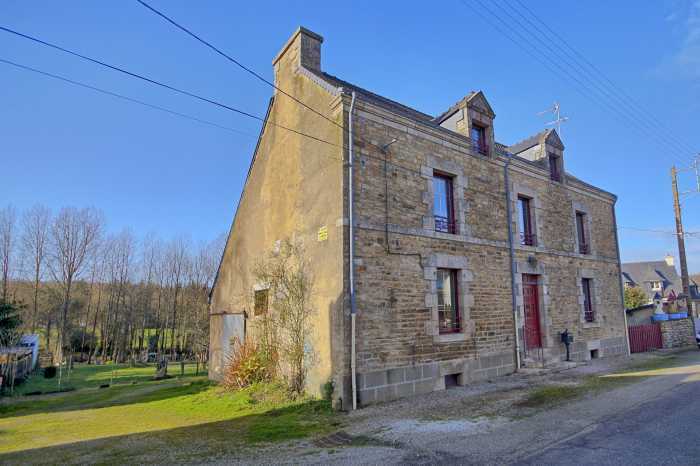 Properties for sale in Brittany, France - AHIB-2-DN-618 Colpo 56390 Large village house to refit with 3/4 acre and a building plot! Built in the 1940's and with a decent refit could become a lovely family home. The property already benefits from a decent roof, recent Aluminium double glazing and mains drainage. The property should be considered a live-in renovation project and could be really nice once finished. The property offers on the ground floor: an entrance hall, two large rooms with fireplaces (one of which is used as the kitchen), then to the rear in the stone extension is a recent shower room and toilet, as well as a storage room and a garage. Upstairs are two large bedrooms and a third smaller room. Loft above and a cellar below the main house. Large garden of ¾ of an acre to the rear, part of which is constructible, so you can either extend the present house, or a covered pool, or even sell it on if you wish.